Rally participants listened to speeches and sang along to songs such as “This Little Light of Mine” during the Jamaica Plain rally. To Raquel Sáenz, activism is more than just a passion project: It’s a way to honor her family and prevent the past from repeating itself. When she was 5 years old, Sáenz said, her father and two older siblings were stopped for a traffic violation and deported to Mexico. Sáenz said she stayed in the United States with her mother and younger brother. Now 32, Sáenz served as the master of ceremonies for a rally in Jamaica Plain on Sunday that protested against the separation of migrant families along the US-Mexico border. About 150 demonstrators gathered at the former Blessed Sacrament Church building on Centre Street Sunday afternoon for the rally, which was organized by Cosecha Boston and the Dominican Development Center, which is headquartered in Jamaica Plain. 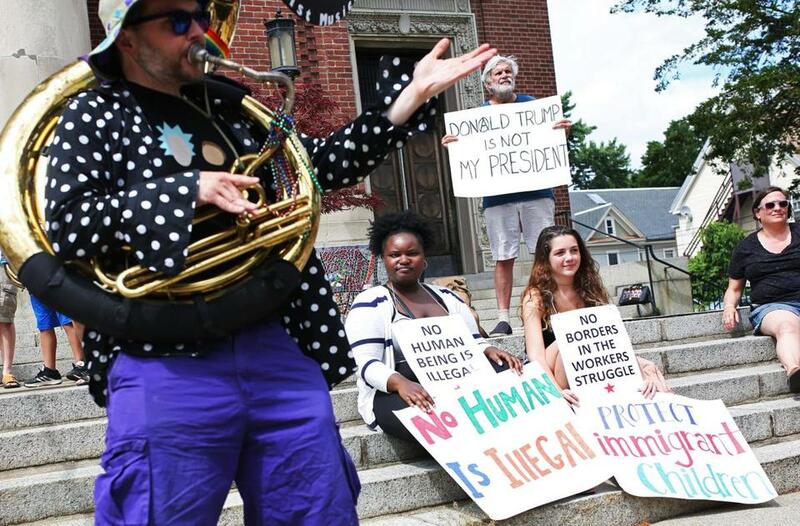 Demonstrators brought signs that declared “No human is illegal” and “Keep families together.” In between speakers, protesters sang along to songs like “This Little Light of Mine,” played by a mostly brass band from the Boston Area Brigade of Activist Musicians. 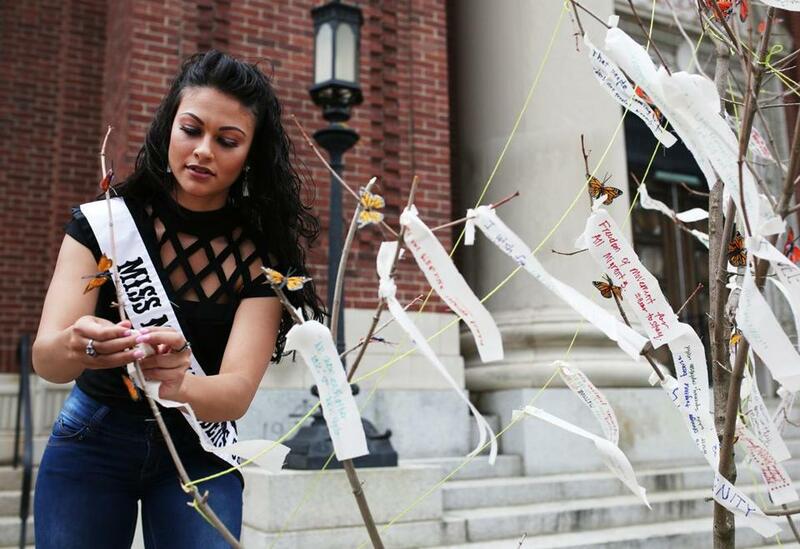 Jeniffer Ruiz, reigning Miss Massachusetts in the Galaxy Pageant organization, added a message to a tree during the rally. Jeniffer Ruiz, reigning Miss Massachusetts in the Galaxy Pageant organization, spoke about the responsibility of those with platforms to speak out and effect change. For Ruiz, ending family separation is also a personal cause. The 24-year-old said her brother-in-law is an undocumented immigrant, but married to her sister, who is a US citizen. Ruiz said her brother-in-law cannot leave the country to allow his family in Guatemala to see his 2-year-old baby. Speaking to a reporter, Sáenz said her parents taught her to stand up for those hurt by unjust immigration policies. US Representative Michael Capuano, who flew back from the US-Mexico border Saturday night, was also in attendance. “[These rallies] are absolutely essential,” said Capuano. “I hope events like this are going on around the country,” he said. Organizers also said they hoped the protest made clear that the issue of family separation affects minority communities all over the country.